Home » Conscious Living – How to Live Consciously! Conscious Living – How to Live Consciously! Learn how to live consciously, without the ego ruling your life. 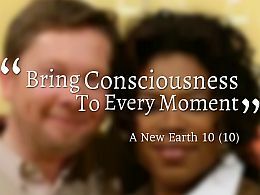 The renowned author Eckhart Tolle has written a book called “A New Earth – Awakening to your Life’s Purpose” where he explains the importance of bringing consciousness to every moment (chapter 10). A conscious living is the key if you want to be happy and successful. Oprah Winfrey was really taken by this amazing book and asked Eckhart Tolle to participate in her web-classes to discuss the concept of conscious living. Below is a summary of their interesting discussion on the art of living consciously – plus video. Are you living a conscious life or are you controlled by the ego? Let’s find out! What is ”conscious living”? What does it mean to live consciously? It means to be present and bring consciousness to every moment. When you are present and still, you don’t allow your ego to react to every situation. Instead, you let yourself be guided by your spirit; a higher consciousness. A conscious living is the concept of being present and listening to the inner voice. This state of being is truly the key to happiness and success. If you are like most people, you perceive yourself as “this is me” and “there is the rest of the world”. The ego sees itself as ”special” and separated from the rest of the world. However, you are not separated from others. You are the Universe, Source of all life, Creator, God, or what ever name you choose to use, expressing yourself through your particular form. This understanding takes you out of the illusion that all you are is a limited little person, and brings about a shift in the way you perceive yourself and others. When you realize that you are not separated from the Universe, you enter the conscious life. But when does this shift in consciousness happen? When do we start living a conscious life? Usually you start with the “outward movement” where you experiencing things and acquire knowledge and possessions. Your “fear” of influence also extends during this period in life and the ego is a very strong force in your decision making. However, at certain point in your life, a shift in consciousness happens. A dissolution of forms starts happening with your physical form with things that you are identified with – such as your job, profession, status, possessions etc. This is what Eckhart Tolle refers to as the ”return movement”. This can also happen when we become ill, when our bodies are not as strong as before, and when people around you begin to die. These types of situations often bring about a sense of presence, and the spiritual dimension can come into our lives very strongly. When this dissolution of forms start happening, there is a possibility that the spiritual dimension comes into your life and you enter a more conscious life. This is a wonderful time for going back home for the “return movement” into spirituality, so that you become aware of your own consciousness (dissolution of form), rather than what consciousness (ego) had identified with (form) that was your life before: job, possessions, physical appearance etc. The “return movement” is the conscious return back to formlessness; when you return to the Source /God, out of which it all came. The return movement is when you start living consciously and when you are present in every moment. When the ego is no longer identified with the “return movement”, it becomes what it is suppose to be: an opening to the realm of spirit. The older you get, the more conscious you become that being is of more value to you than doing. But you don’t have to wait for this “movement” to happen to live consciously. You can start right now! To live a conscious life, is not about what you do. It’s about how you do things. How you do things determines whether you are fulfilling your destiny or not. It is only the being that you bring into your doing that matters. So whatever you do, ask yourself, are you doing it in presence, or is it just a means to an end because you want to get to some future moment. What energy flows into the doing? Is it negativity or is it the presence and consciousness? The different energies will reflect your life, so the choice is yours. As you accept what is and stay present, you will start enjoying whatever you are doing. You can start your spiritual “return movement” and live consciously right now, by bringing consciousness into everything that you do. Remember that what you do is always secondary. Who you are is always primary – whether or not you are connected within yourself with that dimension of being, spirit, or consciousness. When you honor this moment, you honor yourself and everyone around you. When you honor this moment, you honor life. When this happens, you enter the “flow” and your life will then “flow” in the direction of your dreams. Video clip with Oprah and Eckhart talking about conscious living.